After ending our GEA exertions above the village of Patigno and with the luxury of La Catinella, today we enjoyed a slow start by catching the 9.15 bus for a 45 minute ride down narrow twisty roads to the interesting town of Pontremoli. We had five hours there before another 45 minute ride, this time in a Trenitalia air conditioned coach, to the port of La Spezia and air conditioned rooms (this is important) at Hotel Mary, opposite the station, where we are to spend our final two nights of this trip. 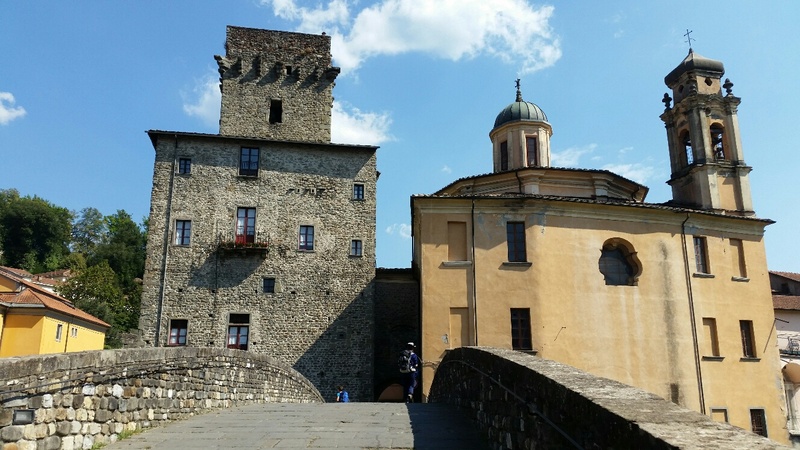 Pontremoli is a lovely small town slightly overlooked by a motorway carrying traffic that must have previously overrun the place. We wandered down ancient streets with ornamental lintels, stopping for a coffee at a Swiss café before ambling up to the Piagnaro Castle past some wonderfully ornate benches. A fine exhibition of Stele statues (mysterious pagan sculptures dating from as long ago as 5000BC) held our attention for some time, aided by the English translation headphones. Then a wander around the castle ramparts, many of which contained what appeared to be private apartments, before adjourning for lunch at San Francesco il Lupo restaurant. After that, La Spezia beckoned. It's a busy naval and commercial port as well as being a gateway to the famous Cinque Terre area. A tourist trap. Very busy. We dined in a pizzeria that did salads, sitting next to a lady from Florida and with a 'you've been framed' sort of programme on TV in the background. There will be more in a slide show, but the top two pictures were taken in Pontremoli, the bottom one is near the sea front at La Spezia. 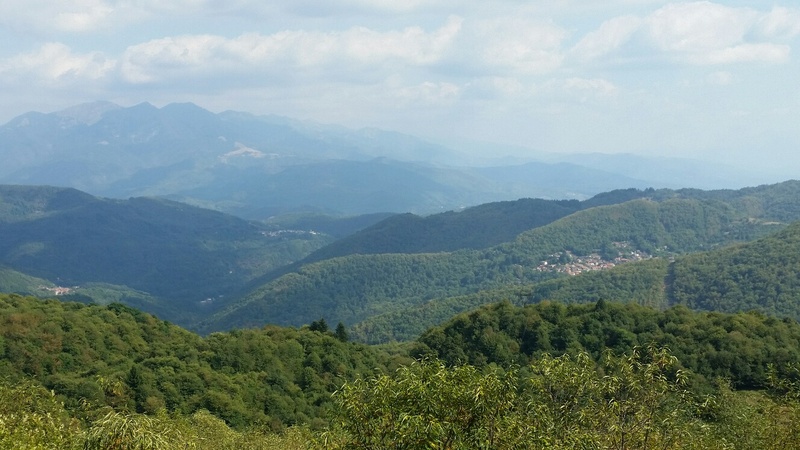 Another fine day in the Apennines. The €3 breakfast at the Ostello was a help yourself affair, worth about €3. It was an acceptable place to stay though, and by 8.45 we were on the road back up to the pass, about 2.5 km of tarmac - the only significant amount of tarmac on the entire trek. There was a welcome chocolate shop on the pass, and a church within a church to distract Cary from his continuing uphill struggle. Twelve days trekking without a break was starting to dismantle his recalcitrant knees. 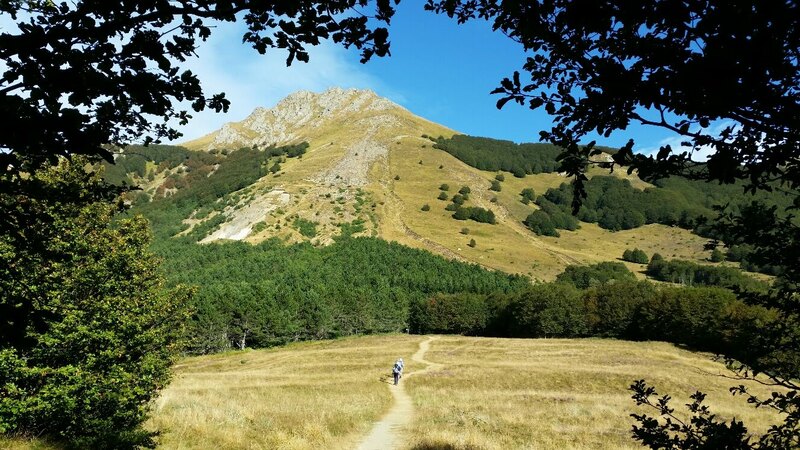 However, lovely forest paths made light going of the saunter up towards Monte Molinatico. But the descent down a rough track with rolling stones was perhaps the least pleasant phase of our entire trek. This warranted a break for lunch under a shady tree shortly before arriving at Passo del Brattello, where the café-restaurant was open and we enjoyed post-lunch ice creams. Cary probably loaded up with more cake for his final afternoon of exertion. 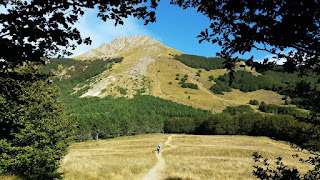 Luckily, the paths traversing unseen Monte Cucco to Passo del Borgaro were through relatively cool, shady woods. 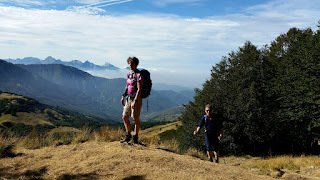 Despite meeting a couple of trial bikes - the only people we met today apart from a lone hiker near the start and a company of horsemen near Brattello - the surface for the rest of our walk was pretty good. We enjoyed views towards our evening destination (top picture) and neared a small wind farm that had blighted our view for a while. Beyond Borgaro the path narrowed as it passed over a rocky crest (middle picture), before reaching a large monument to World War ll partisans overlooking the Taro valley (bottom picture). This truly is Eric Newby country. By now Cary was flagging so Sue positioned herself just in front of him to try to get him to match her pace, whilst I stayed behind with a poking stick. This seemed to work until Cary's phone rang and he ground to a halt in order to buy a flat! Abandoned on the trail, he nevertheless managed to reach Passo Due Santi before we had got through to La Catinella, 5 km down the road in the village of Patigno, who we had arranged to pick us up. We still couldn't get through to tell them we'd arrived at the pass. Cary wasn't impressed by the prospect of a further 5 km saunter to Patigno! Sue disappeared off to the rifugio, from where contact with our overnight accommodation was eventually made. We had a further wait at the rather desolate road head at Passo Due Santi and were somewhat relieved when La Catinella's Skoda Roomster finally appeared. Mario Theresa and Stefano duly welcomed us with the usual pot of tea, beers, excellent rooms and fine food. The ravioli went down particularly well. They remembered guide book author Gillian and asked us to pass on their best wishes. What a superb rifugio. Marcello and his smiling assistant looked after us well. Last night's giant pot of tea was 'on the house'; each group had a dormitory of their own (many guardians would have crammed us all into one room); food was tasty, they clearly enjoyed cooking it, and there was no limit on quantities; total cost for all four of us - half board plus beer, wine and paninis for lunch was €180 (net of Alpine Club discounts). After chatting to Marcello and passing on Gillian's best wishes ("hello Gillian, enjoy AV1", says Marcello), it was well after 9 by the time we got away from Rifugio Mariotti. There was cloud and a strong, cold wind. The rifugio didn't look at its best as we glanced back at it (top picture). We followed the regular GEA route to the summit of Monte Marmagna, Cary taking a less exposed path. 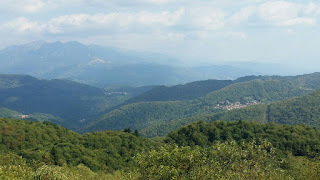 The top was in and out of cloud, giving us brief glimpses of yesterday's ridge, and a fine view down to the sunlit Magra river valley that runs inland from La Spezia. It was increasingly blowy as we descended awkwardly to the next col, Sella della Braiola, so we decided to avoid the exposed section of ridge over Monte Braiola and Monte Orsaro, dropping to join path 727a which rejoined the main GEA path at Foce del Fosco. Gloves and woolly hats were needed briefly. 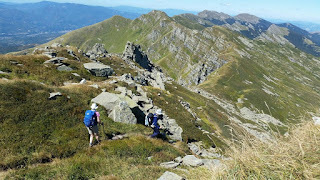 Two others from the rifugio were met as we descended. They were taking a higher route. 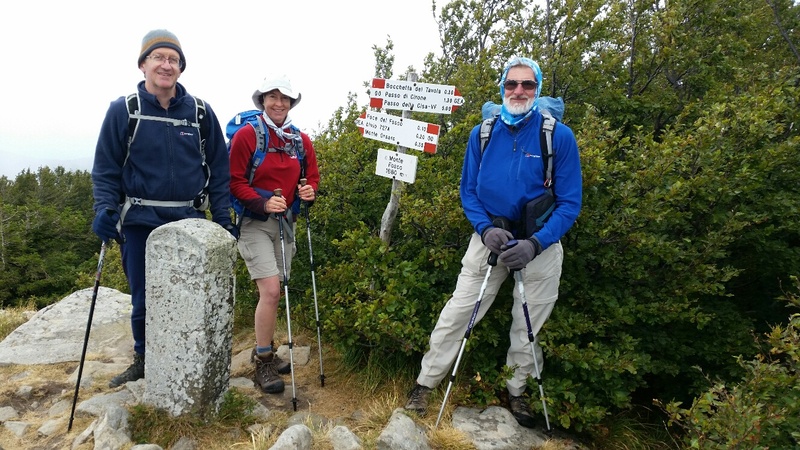 Monte Fosco's 1680 metre summit was easily reached - any difficulties with the wind were over, though (see lower picture) some wimpier members of our party still needed gloves and woolly hats. The rest of our day was spent in and out of trees on good paths with occasional undulations. Good progress was made after we had lunched on Marcello's giant butties at Passo di Cirone, where the Romanesque style chapel was securely shut. The Alps remained coyly unseen today beyond the Po plain, but a motorway became prominent far below. At this moment it's probably in a tunnel far below us. The motorway disappeared as we fell off our last map and coasted down to Passo della Cisa past munching horses, autumn crocuses and a plethora of other different wild flowers. We had originally planned to stay at Locanda degli Aceri, 1.5 km to the south, but it's closed. With Gillian's help we had found an alternative, 2 km down the road to the north. The walkers' hostel (Ostello Cisa), a magnificent large stone building, serves walkers who tackle the Via Francigena pilgrimage from Canterbury to Rome. It has four German pilgrims, as well as us tonight, so it's busy. We have a spacious room for four. There's no wifi or phone signal here, so readers will, I'm afraid, just have to be patient. Later: after an ordinary meal with the German pilgrims we called it a day. 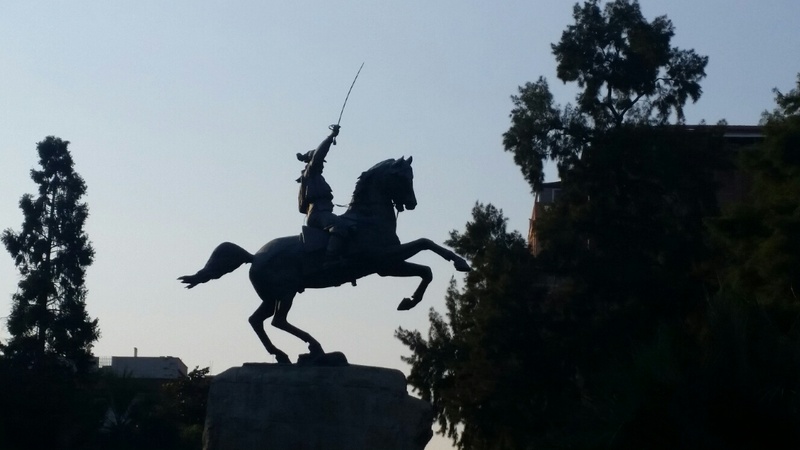 Last night's meal was ok, and we enjoyed the company of the Belgians for the final time. Yves apparently has an occasional assignment - as a clown. He would make a good one. We dissipated after our pasta and main courses (which included good salads), after waiting a while for the dolce that never arrived. Never mind. Today dawned sunny and warm again. The wind has changed. A cool NE breeze helped us today. We aren't as hot and sweaty as on previous days. There was no threat of an electrical storm. Fuelled by fresh croissants, we started steeply up the ski piste behind the hotel. At the first opportunity for a break I took my sunglasses off and sat chatting to Michel for a while. Then the five of us set off in Graham's long laid footsteps to rejoin the Apennine backbone at Passo del Giovarello. Here we took a few final photos and said goodbye to Yves and Michel - they were having a very short, leisurely day, staying at Rifugio di Lago Scuro. Continuing along the splendid ridge (pictured), we pottered along slowly, admiring views to snow clad Alpine ranges in the distance. These were becoming a little clearer to see, having first been discernable from Passo Pietra Tagliata yesterday morning. Passing over Monte Sillara, with its elaborate summit shrine, we dropped steeply to a massive cairn. It was near here that Sue asked why I wasn't wearing my sunglasses. "Perhaps because I've left them somewhere!" Examination of pictures taken revealed no sunglasses at the first pass, so I decided I must have left them at the earlier stop when I was chatting to Michel. They were new, and quite expensive, so as we'd only covered 6.3 km up to this point I decided to go back to look for them. 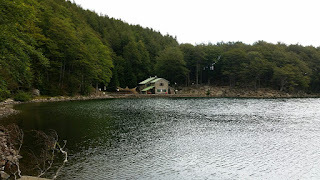 A 9 km round trip involving about 600 metres ascent. But a lovely ridge walk that I didn't mind doing three times. I passed the Belgians by the shrine and then took a short cut that led me down the wrong ridge, necessitating a yomp through bilberry strewn crags to regain the safety of the correct ridge route. The specs were where I thought I'd left them. 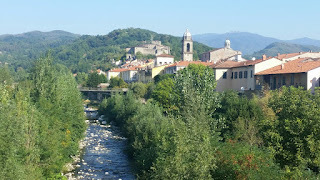 So I was nearly back at Prato Spilla. The ridge walk to the large cairn was as scenic as it had been earlier. I stopped for lunch before traversing Monte Sillaro. The rocky crest wasn't a place to rush. There was nobody around and a fall could have been awkward. 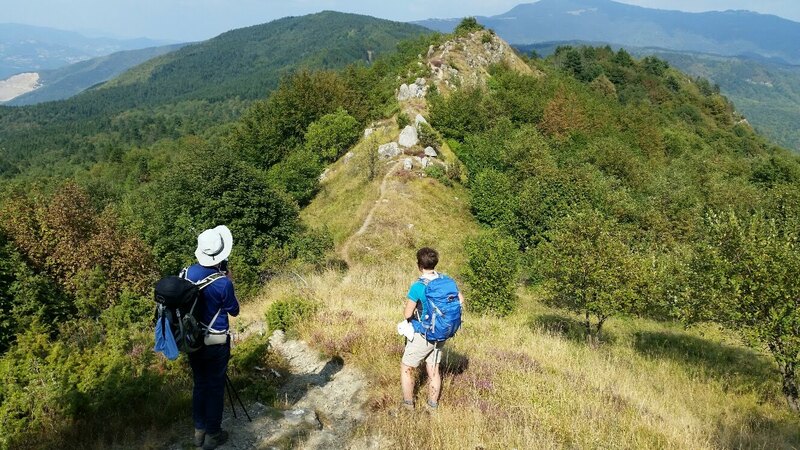 Continuing over mixed ground in spectacular countryside, I met three people struggling over a bouldery section, before ascending to the rocky summit of Monte Matto (1837 metres) from where I could see the others in the distance. We were separated by a long, exposed ridge along which care was needed. After a final summit, and a sharp descent to a pass, I said goodbye to the wheatears, hawks and ravens, and enjoyed a lovely contouring path leading into woodland and past some sandstone slabs to reach Lago Santo Parmense. Across the water I could see Sue, Cary and Graham lounging outside Rifugio Mariotti, presumably enjoying a pot of tea. A few minutes later I'd joined them on the bench outside the rifugio. But there was no tea, they had only just arrived when I saw them. There soon was tea - a good half litre each thanks to the guardian's generous servings. This is a superb little rifugio. We have a room to ourselves and there are maybe eight others staying here. Basic but classy, with a lovely meal featuring soup or pasta, then our choice was ham, egg and potatoes, and lots of tomatoes. Then more tomatoes and a selection of cheeses, and a selection of cakes for dolce. Another fine, sunny day. Excellent breakfast of croissants and the usual stuff, including a plate of parma ham for each of us. Gillian (thanks for your comment by the way) was right - Hotel Passo del Cerreto was a little pricey compared with other places. But for €80 each we got the apartment, a good meal and breakfast, tea, beer and wine, and paninis for lunch, so we aren't complaining. 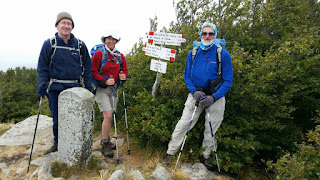 Today was again a walk in tandem with Yves and Michel, who we lose tomorrow as they are having a shorter day. A few other people were seen - mainly at the picnic benches we passed from time to time. We were mostly in woodland just off the main ridge, but we did cross that at Passo Pietra Tagliata ('cut stone pass'), after the first of three abrupt ascents. After elevenses on the pass, we descended quite some way before rising to the Sarzana rifugio, closed for the season but having a small 'winter room' that was open. On this warm day there was no need for that - we enjoyed lunch with the Belgians and a family with an overactive dog. On the way we had passed some tightly packed sheep, whose shepherds also had a pack of about eight white Patou dogs in tow. We also followed a trail of horse manure up a hill. The bells on the animals got steadily closer then suddenly 'disappeared' without a sighting. The third hill was an ascent up a zigzag path through beech woods. Despite setting off with two lunches and almost a gallon of water, Cary was getting weary (maybe he had over eaten?) and needed to be coaxed up the hill. From the final pass it was an easy walk to the modest ski resort at Prato Spilla, which we reached around 4.30 pm. We have a room for four in the Albergo, where we will share a table with the Belgians for our 8 pm evening meal. Sue and I have washed virtually all our clothes, so we are very fresh and clean. 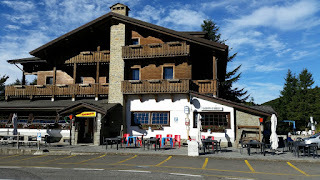 Today's pictures show a typical place in which we are staying - last night's Hotel Passo del Cerreto, a view towards our first ascent of the day, and Sue and Cary cresting a rise in the path. Blue skies were soon tinged with high cloud today, but conditions were pretty much perfect for walking. "Earplugs were of benefit in the full, hot dormitory. We breakfasted at 8, with the rifugio's brioche, toast and biscuits supplemented by a bowl of raspberries that Cary had been out to pick. Tepid caffe latte too. There was a slight delay in paying up (€55 each - all in) and getting sandwiches but we were away by 9 am for our longest day yet. Numerous tents were pitched in the woods near the rifugio. We climbed easily through these woods, back up to the ridge. On the first high point were two men and a boy, in camouflage with guns. They were hunting male chamois. We didn't hear any shots. Being Sunday there were lots of people out. The path traversed, mostly on open ground, sometimes on the crest of the ridge. High cloud made conditions hazy. 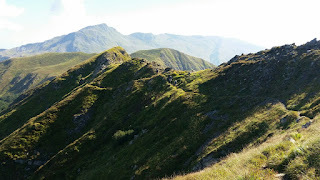 Long stretches over grassland brought us to Passo di Pradarena at about noon, after an elevenses stop on the steep hillside earlier, for Kitkats and the remains of last night's 'torta mista'. At the pass was the sadly closed Albergo Carpe Diem (a fine looking building - hopefully someone will take it on), but there was a bonus of two stalls selling local produce at this busy spot. We bought Fanta, fruit, some cheese and a packet of pastries filled with Nutella, stopping in the shade for the drinks. Just as we were leaving, Yves and Michel arrived, having stayed at Rifugio Battista last night, where they too enjoyed a concert that lasted until midnight. Their rifugio was also full. It would be another option that could be appended to Gillian's accommodation suggestions. From the pass, the track descended in woodland before climbing steeply back onto a broad ridge. Lunch was eaten on a promontory with good views and a welcome breeze. Nice cheese and grilled aubergine / courgette sandwich, and a nectarine. That fuelled us for the undulations towards Monte La Nuda, a rocky peak with a derelict tower on top. By now, cloud was swirling in although the summit still gave views east, and to a rocky ridge. From here, it was 600 metres downhill to our goal, first steeply down, then through woods strewn with boulders. One had evidently crashed through trees and landed on the path - it was huge. Way marking was good, and we arrived at Passo Cerreto (1253 metres) at 4.45. Mario provided a pot of tea with lemon before we were shown to our rooms - an apartment across the road, where showers and washing were soon in progress." The Belgians arrived 45 minutes behind us. Quite tired. Dinner at 8 comprised tagliatelle with mushrooms, pork chop and chips, tiramisu and coffee. There are just the six of us plus two other diners. The motor cyclists we saw when we arrived have all left. The Belgians have been put in the dungeon. We are on the second floor. 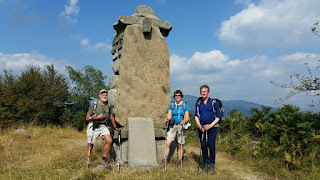 Today's picture shows Sue, Cary and Graham on the Apennine ridge shortly after we reached it this morning.